Here's a piece I made the other night. My stress levels are very high and with that goes the ability to design. 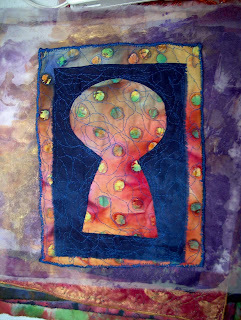 So I started looking through my stash of art quilts I've made over the past few years and decided I liked this design - it's from my 2005 Journal Quilt Series I never sent off to Houston. I'll post those as well. I've decided to work this design in different mediums, pushing it until I arrive at something I'm happy with, again.